Xhilaration® Junior’s 3 Piece Pajama Set – Assorted Colors only $10.99 shipped! You are here: Home / National Stores / Xhilaration® Junior’s 3 Piece Pajama Set – Assorted Colors only $10.99 shipped! Target has another GREAT daily deal offer today! You can get an Xhilaration® Junior’s 3 Piece Pajama Set – Assorted Colors for just $10.99 shipped! There are four different colors to choose from and sizes range from XS to XL! These are super cute and would be great for tweens or teens! The pajamas are priced at $13.99, but an additional $3 will be deducted when you enter the code TGT2TZTU at check-out! Shipping is always free on daily deal items! Hurry! I’m guessing these won’t last long at this price! FREEBIE ALERT: Maybelline lip balm free after coupons! **HOT DEAL: 2 pairs of Mossimo Supply Co Juniors jeans for $16 shipped! Mossimo Supply Co. Juniors Bootcut Jeans only $12.99 shipped! 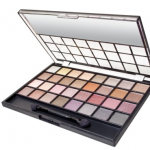 It’s BACK: ELF Eye Shadow Palette (32 colors) only $2.37 shipped! Cherokee® Boys Swim Trunks $6 each shipped!